Wonder Woman addresses Batman by his real name. The League's secret identities were revealed to each other in "Starcrossed: Part II". Wonder Woman keeps Owlman's jet, which gets stuck in "chameleon mode". It is almost identical in appearance to the Invisible Jet she used in "Justice League Unlimited". Batman explains to Superman how they are "understaffed." He brings in Aquaman, Black Canary, Red Tornado, Black Lightning and Firestorm to fight Superwoman and company aboard the Watchtower and keeps them around to start expanding the League. Flash is Wally West and his character model and facial expressions are very similar, despite the different styles. Green Lantern mentions that Flash has a car, which appeared in the second season of Justice League. Lex Luthor: No time for niceties. The Jester: Way to be stealthy, Luthor. Lex Luthor: The moment I shut down the grid, it send a silent alarm. They're already on their way here. Q: Why do Batman and Owlman have different voice actors, when they are supposed to be the same person, only from alternate universes? Q: Didn't the filmmakers realize kryptonite makes Ultraman stronger in the original comic? the Justice League flies high and goes up against... the bizarro world of themselves! 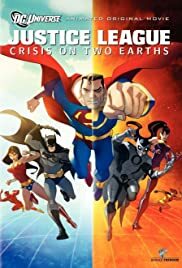 While the best of the lot, Justice League New Frontier, is hard to get eclipsed in its storytelling, this new direct to video release, Crisis on Two Earths, does its best to come close. At first it might appear to be a simple bizarro-world story (or Elseworld tale as it can be called, i.e. Superman: Red Son), where the Justice League is visited by Lex Luthor(!) from the other world, who is actually battling the bad-guy versions of the JLA, and they have to stop them- specifically the mastermind Owlman- from destroying possibly both worlds... or all. What makes it richer is how the writers and directors build upon the tropes and even add some philosophy to the mix - the way Owlman looks at all of the worlds, the nihilism present, and his disgust of free will, is rather morbidly fascinating for the few minutes its given light in what would be otherwise a "kids" movie - and keeps fans happy. I wouldn't say this is a good place to start for newbies to these characters; not so much for a complex story, which is isn't entirely, but that some of the characters are already so well established and that some of the smaller ones may just float by without much consequence (I, who has been catching up on the Justice League animated show, didn't recognize some of the characters unless named). It really is made by fans of the series (the directors are also well-established with these films, practically covering all of the recent ones for better and worse), for fans, as a rock-em-sock-em elseworld story. While some small parts do frustrate a bit (how Owlman is so set in his path towards the end... and then proceeds to go and beat up Batman anyway seems rather redundant), it gives us some great moments in DC animated history. That one line from Batman especially to Owlman, "The difference between you and I - we both looked in the abyss, and you blinked", is a keeper, and some of the quips given by Superwoman and the Flash (yes, the Flash) are really funny. And though the overall outcome of who will triumph and so on can be called practically from the outset, the fun and danger comes in the instances of uncertainty between character fights and the intensity of one-on-one action, or just unexpected moments (the 'Green Arrow' in the elseworld is basically painted Red and made into the Batman villain Deadshot) that delight. One last note - the voice acting here was surprisingly good. It's tricky not having the standard voices for Super/Batmen (I'm always wary hearing Batman not as Kevin Conroy), but William Baldwin actually didn't do too bad, and same for Mark Harmon. 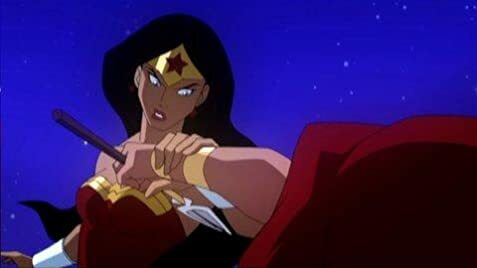 Best of all were Gina Torres as the femme fatale in Superwoman, and James Woods dialing down his usual hammy bad-guy acting for Owlman, who sounds so cerebral one wonders why he has that big suit of armor.